icare is a youth based organization registered under Suswa, an environmental trust founded in the year 1994, with an objective of creating a beautiful and sustainable tomorrow by ‘bringing people together’. We at icare believe in accountability, taking personal initiative and starting a dialogue in the quest for a change. It exists to help dedicated citizens to make a difference in their world through smart, gutsy work; good science; and “bearing witness” to environmental problems by bringing them to public notice. icare-India has received recognition for its awareness building programs involving ‘out-bound education’ and experiential learning. Working collaboratively with public and private-sector partners, icare-India seeks support not only for its own flagship programs but also for those of partners and stakeholders at the local, regional and national levels. 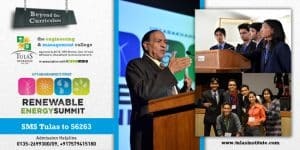 Uttarakhand’s first Renewable Energy Summit committed to advancing future energy, energy efficiency and clean technologies by engaging political, business, finance, academic and industry leaders to drive innovation, business and investment opportunities in response to the growing need for sustainable energy. All these years the youth have not been believed to be the hope of tomorrow for no rhyme or reason. They are a young and vibrant resource with the ability to bring fresh innovative ideas and concepts to the table. According to us what is needed, is tapping into this minefield of energy in the hope to bring the youth together, engaging them in dialogue in the quest for making India a superpower by the year 2020.